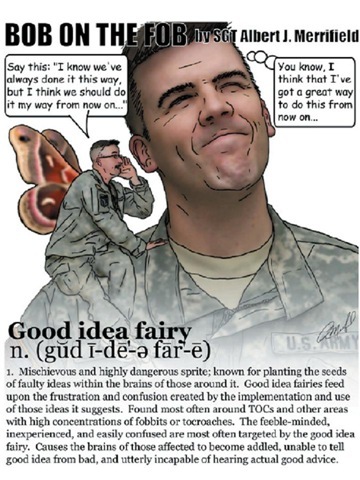 When I was in the Air Force I had one assignment where I worked closely with a lieutenant colonel who was a self-proclaimed “good idea fairy”. Every time we had a meeting he would interrupt to tell us about some idea he had just thought of that might be able to help with what we were working on. Us: The bus was half an hour late to pick up the technicians today because it had a flat tire and the driver had to go pick up another vehicle. Him: Every technician should have his own vehicle so that we never have to deal with this again. Each time he suggested a half thought-out idea, we would have to take time to consider it and the consequences of implementing it. Us: Does every technician really need his own vehicle? Us: Do the technicians have a government drivers license so that they can drive the vehicle? Us: Does transportation have enough vehicles to lend out to one or more of the technicians? Us: If we give the technicians a vehicle, other teams may want a vehicle of their own as well. Do we really want to go down this route? And so on and so on. It’s not that his solution was terrible, but that a little bit of extra consideration would have led him to realize that there were a lot of practical problems with it. Instead, we were constantly being side-tracked by discussions about whether or not his ideas had merit. Most of the time, because they were not well thought-out, they didn’t. He took pride in being a “good idea fairy” and every now and then he did have good solution, but most of the time his poorly considered solutions caused us to waste more time than they saved. When you are holding a meeting, you want to encourage participation from the attendees and if you are constantly shooting down someone’s ideas, it might discourage others from speaking up in the future. Because of his rank and position and because we didn’t want to discourage people from speaking up, I don’t think anyone ever spoke to him about it, but I’ve always thought back on that when an idea pops into my head in the middle of a discussion. The question then is how do you encourage creative solutions but also cut down on the number of Good Idea Fairy ideas? I don’t know — maybe you can’t. Maybe in order to discover gems you have to sift through a lot of dirt. Maybe that’s just part of the collaborative problem solving process. What do you think? Is there a way to cut down on the number of Good Idea Fairy ideas while still encouraging people to speak up when they have a potential solution to a problem?